Help the clockwork mage create a tonal inverter to counteract the power of Sunna'rah. Lord Vivec's condition continues to deteriorate as his energy drains away. Archcanon Tarvus believes that Chodala's staff holds the key to saving the Warrior-Poet. However, it also makes the Ashlander practically impervious to harm. Talk to Archcanon Tarvus in Vivec's Palace. Find Barilzar at his tower. Talk to Barilzar's former hirelings in Molag Mar. Recover the Dwemer components from Nchuleft, Arkngthunch-Sturdumz and Galom Daeus. Collect Sunna'rah and return to Vivec's Palace. This quest is started by talking to Archcanon Tarvus after finishing Divine Delusions. Lord Vivec must conserve his remaining energy, so we need to solve this problem on our own. It all comes back to Chodala. That damned Ashlander's draining the Warrior-Poet's power! We need to stop him and get that damn staff! Sunna'rah makes Chodala invulnerable. How do we circumvent the staff? How should I know? That's not a skill the Tribunal teaches. Return to Barilzar's tower and get Sotha Sil's former apprentice to come up with some kind of countermeasure. I'm sure he knows more than he's told you. You see right through me, Outlander. I have more worries than a kwama queen has eggs. I'm talking about Chodala's sister. Seryn claims to want to help, to want peace, but I don't trust her. Seek out Barilzar, but be wary of the Ashlander's sister. I'll return to Barilzar's tower and see if he knows how we can circumvent Chodala's staff. Return to Barilzar's Tower. When you get there, he won't be in the laboratory (like he was last time), but as you enter the room you will be able to hear him. Barilzar: Is someone up there? I could use some help down here! Go through the door to the Tower Understructure, then down the stairs to a room with a large furnace in it. You will see two skaafin standing near a door on the other end of the room. Barilzar: Hurry, please! I have a natural aversion to daedra! Barilzar has a natural aversion to these. Fight the skaafin. Once they have been defeated, a Hunger will appear. Defeat that, and you will be able to go through a door to Barilzar's Inner Sanctum. Barilzar will be working on a dwarven spider when you enter, but is willing to let you interrupt him and talk to him. So hard to concentrate and maintain schedules when interruptions constantly occur. Don't they know the Great Gear never pauses in its rotations? So that was you up there? I appreciate the assistance. Daedric entities can be very unpredictable. Why were Daedra attacking you, Barilzar? Logic has very little place in the behavior of Daedra, my helpful associate. Studying the fabric of reality does tend to attract unwanted attention, but these creatures appeared just before you entered my tower. I wonder, why have you returned? 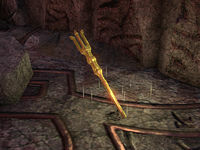 I located Sotha Sil's tool, but it's been altered to steal Lord Vivec's divine energy. Ah, a modification of my master's old experiments, turning a simple tool into a dangerous weapon. Ingenious! Evil, yes, but also quite brilliant. Hmm. A tonal inverter should counter it. Uses sound waves to temporarily disrupt the flow of energy. Do you have a tonal inverter I can use? No, of course not. I just invented it! I need proper components to build such a device. My hirelings scour the land for materials all the time. Here's a list. Head out the back door and ask them to direct you to these common Dwarven components. If asked, Barilzar will tell you that you can find his hirelings—who don't actually work for him anymore—in Molag Mar. 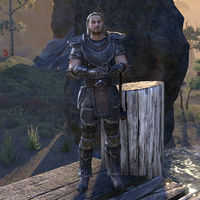 Barilzar also believes that he will not have any more trouble from daedra because they are more interested in you than in him. You can leave the tower through a trapdoor in this room that will bring you outside and behind the tower. Head back west to Molag Mar to find the hirelings. 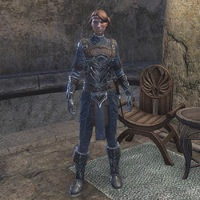 Leona Blasio can be found on the upper level of Molag Mar, near a door to the Penitent Pilgrim Inn. If you're another pilgrim looking for charity, I suggest you move along. I have neither the time to waste nor the gold to spare. I'm currently between employment and my own funds have become dangerously depleted. Barilzar sent me to talk to you. I need to find the items on this list. Let me see that. What's that crazy mage need this time? Hmm. I suppose you could find a manual clockwork shaft in the Nchuleft ruins. But I'd avoid that place if I were you. If the roof doesn't collapse, the constructs will rip you apart. Barilzar needs it to build something important, so tell me how to find the manual clockwork shaft. Deep in the ruins churns a big machine. When I was there, it sputtered and vibrated, collapsing parts of the ceiling. Lava and rock fell everywhere. You need to get past that and some nasty constructs to retrieve the item. Why don't you work for Barilzar any more? For my own health and sanity, I had to break ties with Barilzar. Snorfin can be found on the docks of Molag Mar. I feel like such a puny snowback, hiding here in Molag Mar! But you don't want to hear about my troubles. What can this broken Nord do for you? Barilzar sent me to talk to you. He said you could help me find the items on this list. Barilzar! He's the reason I'm a shattered man, doomed to become a cowering sheep like the rest of these pilgrims! Oh, all right. Let me see that. Hmm. Arkngthunch-Sturdumz. You can find a sonance generator there—after you deal with the steam trap. What's that about a steam trap? The cursed contraption! I almost had it figured out when a ghost floated up to me. No problem, I think, but then it enters a centurion! Ghost machines! No sane Nord can fight ghost machines! I dropped my notes and ran as fast as I could. You left your notes in Arkngthunch-Sturdumz because of a few ghosts? Not just ghosts! Ghosts that possessed Dwarven machines! I'm through working for that crazy old mage and his clockwork monstrosities! But if you want to get past the steam trap, find my notes and follow the directions. Volrina Quarra can be found inside The Penitent Pilgrim Inn, on the lower level. Damned vampires! I'll find a way to make them pay for what they did to my brother, I swear it on the Tribunal and any Daedra willing enough to listen! What do you want? Can't you leave a person to her anger and her grief? Barilzar said you could help me locate the items on this list. He did, did he? Let me see that list. Hmm. Well, the crazy old mage always said there were no coincedences. The inversion conduit. I saw one in Galom Daeus—right before I barely escaped from those damned vampires. Tell me about these damned vampires. Eager to become cattle for the bloodsuckers? The Berne clan killed my brother, damn their eyes! The item you seek was in the manufactory, but you'll need a control rod to get a dwarven spider to unlock it for you. Why did you stop working with Barilzar? Because the mage wanted to send me to the far side of Vvardenfell and I need to remain here. I'm not going anywhere until I make the Berne clan pay for what it did to my brother. If you can kill some of the bastards, that'll be a start. This gives you your three locations to travel to to find the required components: Arkngthunch-Sturdumz, Galom Daeus, and Nchuleft. How do you disable the vents? Arkngthunch-Sturdumz is a Dwemer ruin located northwest of Gnisis, right on the coast. Shortly inside the entrance, you will find Snorfin's Notes on the ground. 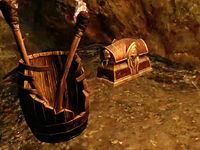 The notes mention that there are furnace vents that stopped him from being able to reach the Dwarven chest with the component. They also mention valve controls near the vents. Going through the ruin, you will have to fight Dwarven constructs as well as Spectral warriors. Follow the passageway to a large chamber with many enemies. There is a passageway off to the right that will lead you to the furnace room, without having to fight all those enemies. At the end of that passageway, there will be a pair of Spectral warriors—but one of them, just before it dies, will send his spirit into a nearby Dwarven Centurion. In the next room, there are three furnace vents blowing fire onto a chest on a platform in the middle. Each vent has a release valve on the back—go to each vent and activate the valve in order to stop them from venting fire. Then you can go open the chest and retrieve the Sonance Generator. How do you disable the ward? Galom Daeus is a Dwemer ruin slightly northwest of Nchuleftingth, and north of Suran. It is filled with Berne Clan vampires. After fighting your way through a few long hallways filled with vampires, you will find Volrina's Notes in front of a door. The notes describe some vampires trying to control Dwarven spiders using control rods, with variable results. Through the door is the Galom Daeus Manufactory. There are more Berne Clan vampires in here, including a brother and sister tinkering with an inactive Dwarven spider near a pedestal with a chest on it. The chest is currently inaccessible due to some kind of ward. Jastia Berne: Treasure, dear brother. Once the ward is disabled, retrieve the Inversion Conduit from the chest. Nchuleft is a delve located southwest of Vos. In the Ingress area, you will encounter Ash Exile hostiles. The easiest way to get to your goal, the necessary Dwarven part, is to go through the Nchuleft Ruins. Go down the stairs, turn right, turn left at the corner, then right again when the next hallway branches off. At the end of that will be a door to the Ruins. Go through the Ruins and enter the Nchuleft Depths. Where you will enter in the depths is at the bottom. Follow the footpath along the side of the Depths, to the chest containing the Manual Clockwork Shaft. The alternative is to enter the Depths through one of the doors directly from the Ingress, but that means finding your way down the tower in the center of the Depths, and fighting many Dwarven constructs, including multiple Dwarven Centurions. Once you have all three components, return to Barilzar's Tower. He will be in his Laboratory again, and will say as you enter, "Have you only just arrived, or is this you returning? Can't always keep the cogs and pistons in line." Ah, I remember! The components for the tonal inverter! Were you able to acquire them? Yes, I recovered the sonance generator, the inversion conduit, and the manual clockwork shaft. Impressive! I thought I'd never see you again. That's what usually happens when I employ hirelings to acquire rare and exotic items from dangerous locations. Well, the Great Gear doesn't dawdle and neither do I! Hand them over and I'll get to work. Here are the items you requested. Barilzar will walk over to one of the tables in his lab and tinker for a few seconds. Barilzar: One tonal inverter coming up! (twisting something) Connect this, tighten that spring, don't explode! (hitting it with a hammer) Almost done...there! Whew! Got it right the first time! No explosions... yet. Go ahead. You can take it. I'm sure it's stable. Mostly sure. Once the tonal inverter is in your possession, talk to me and I'll tell you how it works. Take the Tonal Inverter from the table, then talk to Barilzar again. Do you like it, my latest creation? I call it the tonal inverter! Did I mention that already? No matter, it should counteract Sotha Sil's modified staff, at least momentarily. I assume you know how to use this, correct? No, I don't know how to use the tonal inverter. You won't use it, anyway, not if you plan to fight the one who wields Sotha Sil's staff. Almost impossible to operate the tonal inverter while also engaged in battle. It's too cumbersome. So how do I use it to counteract Sunna'rah? Sunna'rah? The blessed staff? I suppose the name fits. Sort of. You'll need someone to assist you. Someone you trust. Oh, not me. Too busy. Too fragile! But using the tonal inverter is definitely a two-person activity. Is the tonal inverter hard to use? Easy as scrib jelly pie! One person operates the controls to generate the sound waves. When it reaches the proper pitch, you activate the inverter and discharge its energy to disrupt Sunna'rah's power. Temporarily. Here. I wrote you instructions. Barilzar will give you the notes on How to Use the Tonal Inverter. Leave his tower and return to the Archcanon's Office in Vivec City. When you get to the Archcanon's Office, Seryn will already be there. The Archcanon is not happy about this, and has called in a pair of Buoyant Armigers. Seryn: I'm here to help...If you won't listen to me, listen to the Outlander! Archcanon Tarvus: (walking toward you) Thank the Three, the Outlander has returned. Was Barilzar able to help us? Seryn groans in frustration. Talk to the Archcanon. Pay no attention to this Ashlander. She's been blathering on about Lord Vivec's condition and how she can help, but I'm certain it's a trick of some sort. I was just about to have her thrown out of the city—or possibly tossed to the slaughterfish. That's Seryn, Chodala's sister. She helped me in Ald'ruhn. I know who she is! I still don't trust her and I refuse to let her anywhere near Lord Vivec. Who knows what an Ashlander would do while the Warrior-Poet is in such a fragile state? I need her help. It's going to take two of us to operate Barilzar's tonal inverter. A tonal what now? Well, since I can't go with you, what with Lord Vivec requiring my undivided attention, I suppose we'll have to let the Ashlander assist you. Very well. Take her and defeat Chodala. Then bring me his staff so we can restore Vivec. Sunna'rah will soon be in our hands. If that old idiot is what passes for a Tribunal leader, it's no wonder the Houses are in such disarray. No time to dwell on that, though. I found my brother! And it's worse than I feared. Chodala's quest for power has led him down a dark path. What do you mean, a dark path? Chodala and his most loyal followers have taken refuge in a ruin called Kaushtarai. It's an ancient shrine devoted to the Daedric Prince Malacath. I think my brother plans to ask the God of Curses to help him. I've got a device that will counter Sunna'rah, but I need your help to use it. It will allow us to stop Chodala? Then of course I'll help you. Since the Tribunal's dogs took my weapons, I'll need to replace them. Meet me at the ruins when you're ready. I'll see you at Kaushtarari. Kaushtarari is located on one of the islands to the southwest of Sadrith Mora. You'll meet Seryn on the stairs outside the ruin to give her the tonal inverter. Here we are, on the Furious One's bloody doorstep, preparing to enter a Daedric ruin to try to stop my brother's march toward power. I hope that device you mentioned really can counter the invulnerability granted by the staff, Sunna'rah. Take this. It's a tonal inverter. It should disrupt the staff's power for a short amount of time. Well, that's larger than I expected. But it looks simple enough to operate. I suppose it's better that I work the device. I'm not sure I'm capable of attacking Chodala. He's still my brother, no matter how dangerous his beliefs have become. Take a look at these instructions. They explain how to use the tonal inverter. I'll help you counter the effects of Sunna'rah. Maybe once we neutralize it, Chodala will listen to reason. I know that's probably just wishful thinking. I'll settle for finding out who tempted Chodala with that damn staff. Enter the ruins and Seryn will follow you. 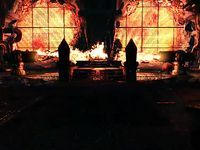 Inside the ruins, you will encounter some skaafin, but as you enter the main chamber, you will also see that most of the Red Exiles have been slaughtered. Renos Oran is still alive for the moment and can be talked to. Chodala…he's gone mad. Sought to make a deal with a Daedric Prince…. Chodala appealed to Malacath…but the God of Curses rebuked him. Killed us all…said Chodala already served…another…. Where can we find Chodala? He went…deeper into the ruins…into Malacath's shrine…. You will encounter more skaafin between the Red Exiles and the door to Malacath's shrine. Seryn: These creatures…they don't belong to Malacath. Another Prince's power is at work here. Enter the shrine and you will see Chodala yelling at the statue of Malacath. Chodala: You don't refuse me, Malacath! I am the Nerevarine! Seryn: Chodala, brother, stop this madness! Chodala: (using Sunna'rah to make himself invincible) You bring this Outlander to kill me, sister? You can't harm me! I have a powerful patron on my side! Seryn: (to you) The staff protects him. You can't hurt him until we use the tonal inverter. I need a moment to get this working. Chodala: What is that? No matter. You are no longer worth my time. Seryn: Skaafin! They serve the Prince of Bargains. Keep them busy while I finish this. Chodala summons three skaafin to fight you. Once you defeat all three, Seryn tells you the tonal inverter is ready. Stand in front of Seryn, in the pool of light from the tonal inverter. Then, use the tonal inverter to direct the sound waves towards Chodala. This will knock him off the platform in front of the statue, and knock Sunna'rah out of his hands and away from him. Chodala: My protective shield! What have you done? I'll destroy all of you for this! Fight Chodala. Once he is defeated, Seryn will show regret at the necessity, saying "Oh, brother, why did it have to come to this?". Next, Seryn will say, "Azura, we've defeated the false Nerevarine, just as you commanded" and run towards her brother's body. Talk to her. That was…harder than I expected. Chodala was so angry…so full of rage. Not like himself at all. Still, I can't believe I helped kill my own brother…. I know that! It was either Chodala or the lives of hundreds of Dunmer, all because he convinced himself he was the Nerevarine. Or someone convinced him. Either way, my brother is dead and the Cavern of the Incarnate has another resident. We should return to Vivec City. Take Sunna'rah and I'll meet you back in Vivec City. Your Archcanon made it quite clear that the staff was the key to saving Vivec. I need to take care of my brother's remains. Then we'll be done here. Go retrieve Sunna'rah from where it fell near the statue. Then, make your way back to Vivec's Palace. When you get to the palace, go through the doors on the sides of the Palace Receiving Hall to enter Vivec's Private Chambers. Go down the stairs into his chamber. Vivec will be lying motionless on a bed, with the Archcanon watching over him. Talk to the Archcanon. Oh, this is terrible! Lord Vivec collapsed! Tell me, Outlander, were you able to defeat Chodala? Have you brought me his staff? I'm afraid Lord Vivec may not last much longer. We defeated Chodala and brought back Sunna'rah. And just in time! According to my calculations, with every use of Sunna'rah, Chodala drained more energy from Lord Vivec. It almost killed him! But we can use the staff to save Vivec. Just plant it in the floor and the power will return to him. I'll plant Sunna'rah in the floor and return Vivec's power to him. At the foot of the bed, there is a seal on the floor. Behind that is a small stand, which is where you need to place Sunna'rah. 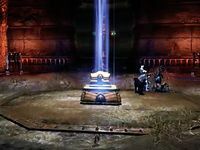 When you do, a golden light will emanate from Sunna'rah to Vivec for a few seconds, before it turns green. Vivec starts thrashing on the bed, as this is clearly doing more harm than good. Archanon Tarvus: Perfect! It's working just as I expected! Seryn runs in at this point. Seryn: What are you doing? It's killing him! Archcanon Tarvus: What did you expect? That's the point of all this after all. Seryn prepares the tonal inverter again. Use it on Sunna'rah to disrupt the procedure. Doing so will cause Sunna'rah to send out a shockwave that knocks you and Seryn to the floor. Before you can get up, the Archcanon reveals that he is (and has been for some unknown amount of time) Barbas, the servant of Clavicus Vile. Barbas creates a projection of a clockwork sphere. Barbas: "You're too late! I see it now, the Clockwork City! Look what Barbas has found for you, Master!" He then takes Sunna'rah and disappears. 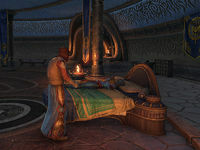 A ghostly form of Vivec separates from his body and rises up, leaving his physical body lying on the bed. Get up and talk to Seryn. I knew something was wrong as soon as I approached the palace! I could feel it in my bones. I was on my way here when Azura showed me a vision. I saw Sunna'rah, killing Vivec. Even without Chodala, the damn staff is dangerous. The Archcanon seemed to know that Sunna'rah wasn't going to help Lord Vivec. I don't think that thing was ever the Archcanon. It called itself Barbas. As an Ashlander, I'm more familiar with Daedric lore than most of the Elves of the Great Houses. Beyond that, I've made a study of the most prominent Daedric Princes. 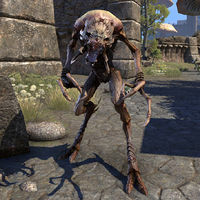 Why are the Daedra relevant to all this? Because Barbas is a loyal servant of the Daedric Prince, Clavicus Vile. I'm not an expert on the Prince of Bargains, but it seems to me that this was all part of some grand plan. Perhaps Vivec can explain things better than I can. Azura's champion... is correct. That was Barbas, faithful hound of Clavicus Vile. A shapeshifter. He killed the Archcanon... took his place. Chodala... Sotha Sil's device... impersonating Tarvus... it was all part of some elaborate plan. That was simply a consequence. They needed Tribunal energy to locate the Clockwork City.. I was the easiest target. If Barbas enters Sotha Sil's city... disaster will follow. I appreciate your help, but I must conserve what remains of my energy. This ends the quest. You can hear the sounds of people panicking and screaming from outside, as Canon Llevule runs in with urgent news. Talking to him starts Divine Disaster. Archacanon [sic] Tarvus wants me to return to Barilzar's tower and ask the mage if he knows how we can overcome the power of Chodala's staff, Sunna'rah. I need to search Barilzar's tower and find the mage. Inside Barilzar's tower, I found that the place was overrun by Daedra! I need to deal with the monsters before I can talk to Barilzar. I defeated the Daedra. Now I can talk to Barilzar and ask him if he knows of a way to circumvent the powers of Chodala's staff, Sunna'rah. Barilzar thinks he can build a tonal inverter to counter the power of Chodala's staff. He needs me to collect the components to craft the device and has sent me to Molag Mar to get help from hirelings he's used in the past. Barilzar's former hirelings pointed me toward three ruins where I can find the components he needs to craft the tonal inverter: Nchuleft, Arkngthunch-Sturdumz, and Galom Daeus. I just need to overcome any obstacles in the ruins to retrieve the items. I retrieved all three components needed to create the tonal inverter. Now to see if Barilzar can build the device he promised. It looks like Barilzar completed the construction of the tonal inverter. I should retrieve it from his work table. Now that I have the tonal inverter, I should ask Barilzar how it works. I received the tonal inverter and instructions on how to use the device from Barilzar. Now I should return to the Archcanon's office in Vivec City and let Archcanon Tarvus know that we have a way to disrupt Chodala's power. Archcanon Tarvus is holding Seryn. I should talk to him to let him know I have Barilzar's device and convince him to allow Seryn to help me use it against Chodala. Now that that's settled and I convinced the Archcanon to let Seryn assist me, I should talk to Seryn and decide our next course of action. 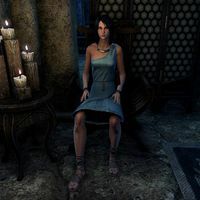 Seryn says that her brother and a few of his followers have taken refuge in a shrine to the Daedric Prince Malacath. I should meet her there. I rendezvoused with Seryn at the ruins of Kaushtarari. I should give her the tonal inverter before we go inside to confront Chodala. Seryn has the tonal inverter. Now to head into the shrine and confront Chodala. Seryn and I have entered the ruins of Kaushtarari. Now we need to locate Chodala and defeat him so that we can recover the staff, Sunna'rah. We defeated Chodala. I should talk to Seryn and see how she's handling all this. Now that Chodala has been defeated, I should gather up the staff called Sunna'rah. I have Sotha Sil's device, Sunna'rah. Now I need to return to Vivec City and see if the staff can be used to restore Lord Vivec. Seryn said she'd meet me there after she takes care of her brother's remains. I need to talk to Archcanon Tarvus. I'll probably find him in Vivec's chambers, tending to the weakened god. Archcanon Tarvus wants me to use Sunna'rah on Lord Vivec so that his divine energy is returned to him. I used Sunna'rah as the Archcanon suggested, but something's wrong! It's hurting Vivec, not helping him! Why has the Archcanon betrayed us? Seryn thought quickly and used the tonal inverter to once again stop Sunna'rah. I should talk to her and see if we can make sense of what just happened. Finishes quest Vivec survived that last attempt—barely. I need to talk to him and find out if he can tell me more about Barbas and what just happened here.